Lorde loves her curly hair--and thinks you should, too. What was once shamed and shunned from society is now becoming not only acceptable, but much sought after by non-curly girls. Recently, the pop star responded to one of her fans online with a blunt (but encouraging) statement about loving her curly hair. "Curly hair is the coolest [expletive] mama," she said. "I love having this halo of hair radiating from my face. The bigger the better! Actually just cut my hair a little shorter so it would be as big and cute as possible." Do you want fluffy, voluminous curls that bounce around like you're on stage with a fan blowing behind you at a New York Fashion week celebrity after-party? Of course you do. 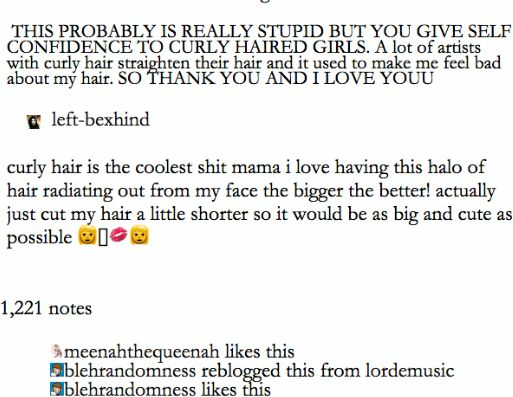 Here are some tips for getting Tumblr worthy hair like Lorde's. When you get out of the shower, it is important not to use a traditional terry cloth towel to dry your curls because the fibers of a terry cloth towel can lead to frizz. Instead, blot your curls dry using a t-shirt. You may or may not be doing this step already, but using a leave-in conditioner is crucial for maintaining your moisture. If your hair is prone to frizz, it could be dryness that is causing your frizz halo. Wavy hair can be weighed down when too many products are used, so we like to use 2-in-1 products that can condition your hair and provide hold, like Curl Junkie Curls in a Bottle, Ouidad Whipped Curls and Curly Hair Solutions Curl Keeper. Scrunch the product through your hair, pushing your ends up towards your roots, to encourage your hair to curl. Now your hair is wet and covered with product, which is likely pulling your waves down. To make sure your curls form (and to help your hair dry faster) use your t-shirt to plop your hair for at least 15 minutes. To plop, lay your t-shirt down on a flat surface like your bed with the bottom of the shirt closest to you. Then bend over and place the top of your head in the center of the t-shirt, so that all of your hair is in a pile. Then roll and tie the sleeves of the t-shirt around your head, then stand up and your hair is neatly piled on top of your head. If you need a visual, here is a complete guide to plopping. Once your hair is at least 75% dry, you still may find that your waves are stretched and not full. Don't stop here, it's time to diffuse. Salon owner and self-proclaimed "King of Curly Hair" Ricky Pennisi says "a diffuser will enhance curls by 30% and is great for those who have naturally wavy or curly hair." To diffuse, cup sections of your hair in the diffuser attachment and bring it up towards your roots. This makes a huge difference in the volume of your hair, and will help you achieve Lorde's look. You may find that diffusing gives you some frizz, so simply spot treat that frizz by rubbing a small amount of your styler between your fingers and smoothing it over the frizzy parts. If some of your curls don't for the way you'd like them to, twirl the curl around your finger to help give it shape. If you really want Lorde's big, voluminous look, once your hair is completely dry flip your head all the way forward and use your fingers to tousle the roots of your hair. This will separate the curls and create an extra boost of volume. You may lose a bit of curl definition but the bigger the hair, the more dramatic the look. If your hair loses volume throughout the day, simply repeat this step to bring your curls back to life. We are constantly doing this in the NaturallyCurly office.